If we all do a little, we can do a lot. In the era of the internet, it is totally possible to start a movement with just one person. The social media hashtag is both a call to action and the action itself. Check out the Eat.Think.Vote campaign for a great example. And while it’s possible for some to #changetheworld in that way, it is hard for me. Yes, I was in that photo for #donthaveonemillion and yes, I posted my #KMFace, but while I know that there is power in statements and publicly supporting the issues that I care about – I truly wonder if I can do that much good while taking a short coffee break or hitting ‘like’ while on the beach. I wonder if doing good can be so easy. This month, 35 volunteers came out to David Thompson Secondary for the first “Big Help” to prepare the market garden for the school season: weeding, preparing growing beds, turning compost, and moving woodchips. And they came because they wanted to do something; to make some impact. Each bed was weeded, the kale freed from a chickweed strangle; the dandelions were finally uprooted. And while we didn’t end hunger or poverty or injustice that evening – we worked together. And that’s the start of making a difference. If we all do a little we can do a lot. I’m inspired by the work of volunteers, showing up and lending a hand. And it’s no difference for any of the large issues that we face on a daily basis: hunger, racism, poverty. It’s the showing up that is so critical – and maybe doing it online is a start. I imagine what would happen if we all did a little, and made one action towards change. We would do a lot. So whether it’s online or on garden remember that anything is possible, you just need enough people pitching in. If we all did a little to support Good Food For All – I wonder how much we’d be able to achieve. So come and join us. We’ve got another Big Help on August 27th at Van Tech Secondary, learn more and lend a hand. Bring turnips and carrots to a boil until tender. Drain. Add garlic, butter, salt and pepper. Mash. Sprinkle with parsley if desired. Enjoy! It’s a Pro-D (professional development) Day at David Thompson today. Oh, how calm it is. Guess what? I got my rainbow carrots photo! 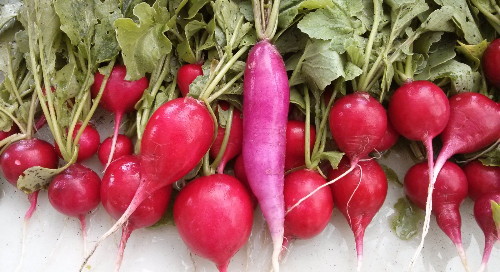 These past two weeks, we’ve had a bounty of these colourful root veggies. I can’t help but be in awe of their beauty.